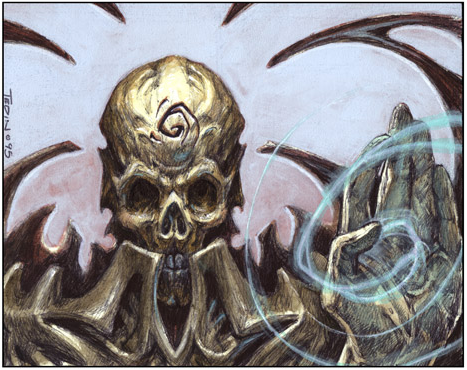 Maxim 1: Any mono-Black deck that is worth its salt takes a big mana approach. You may be trying to build a different “empire” with each deck, but at the heart of every good and fun mono-black deck that I use harnesses the evil of a powerful black-based ramp package. I’ve tried not using a strong ramp package and it feels like I’m fighting with one arm behind my back. [card[Sol Ring[/card], Solemn Simulacrum, and other standard token ramp cards are fine, but you’re falling far short if you equate Black to White, Blue, or Red in terms of required ramp. Notice that I did not list Green. Players nearly universally do ramp right with green; it is touted, in your face, and you have more options. My adamant contention is that the same idea of mandatory ramp package applies to mono-Black, but in a more subtle fashion. Black can ramp nearly as well as Green, it just does so in a more vulnerable way. Sometimes after my casual mono-Black deck dismantles someone’s “good” mono-Black deck, they ask me to look through their deck and I see that critical cards are missing. Mono-Black’s strength comes from the fact that there are a number of cards that increases the mana output of your swamps alongside the use of traditional mana rocks. I was emphatic about it in part I and II of the series and I cannot repeat this observation enough. Players don’t have to shell out the money for Nirkana Revenant, but I recommend that they work up to it if they want to optimize the deck. It ramps and is a wincon all-in-one. However, it is a high crime against the state of Phyrexia if they don’t already have Crypt Ghast in the deck, as it’s the better card to ramp with since it comes out sooner. It’s also cheap and has Extort to boot. I’ve given away about half a dozen Crypt Ghasts over the years and dozens upon dozens of Diabolic Tutors to new players who are trying out commander with a mono-Black deck, but don’t know about the Ghast or the power of tutoring. I consider it an investment in the local player base, because I’m ensuring that they have a better time. Their deck does better, which means they enjoy Magic more, which means they stay in the game, and I have one more opponent in the future. It’s also an investment away from Blue, which I also always support. I dedicated a whole section in Part II regarding land-based ramp and why these two cards were worth their financial cost that I will not fully rehash here. In short, I understand that the days of Cabal Coffers being $5 are probably over, but that card is in demand because it’s really that good. It and Urborg, Tomb of Yawgmoth are worth every penny and they’re probably not getting any cheaper. If you really want to do any mono-black or Bx deck correctly, you owe it to yourself to get at least one copy of each. They are expensive – the $10-to-20 kind of expensive, not $50+ expensive. Maxim 3: This ramp is your path to victory; it fuels your threats, answers, and combats counterspells. Threats: Depending upon your commander, you can build your deck to win in a variety of ways. In all cases, ramp, card draw, and good tutoring is what’s going to get you there in a mono-Black deck. Ramping is the base, however, and it’s nearly a given that good decks need to do it. Whatever threat you’re deploying likely requires mana, and getting to it faster is a very good tactic. Answers: Black has noted weakness. The answers like Scour From Existence and [card]All is Dust[/car] have a high CMC cost. The ramp allows you can cast more/bigger spells if you have more mana. Thus, you can move your board state ahead and still hold that Scour back if you are worried about someone doing something degenerate with their commander. Counterspells: By being able to cast more cards per turn, you can also bait out counterspells with one counterable card after another until the Blue player’s counter are exhausted. Even a Talrand, Sky Summoner deck does not have enough counterspells to counter three other players’ threats if they have decent ramp and are deploying threats. One of the things I absolutely always politic about when a pod of four people sits down with one or two strong Blue decks is that you have to cast spells. Invariably, someone starts to complain about their stuff getting countered after they purposefully didn’t cast their “good spell” for two turns. Blue players are not invulnerable; you thinking that you’re playing around their counters only helps them. This is not 1v1. Attack them early and often, even with your utility creatures, and don’t be afraid to play your spells. If the three other players are all holding back and ‘playing around’ the Blue players and not advancing our boards, they’re essentially Time Walking us and drawing more counterspells by casting their instant-speed draw right before their turns start. This plays right into a Blue player’s hand (pun intended) and is the natural response for less experienced players. Make the Blue player use their counterspells and try to bait out the counters first so that the spell you really want to resolve will get through. Also, always attack the Blue player with the cards that they do allow to get through first, because they may use available mana to respond to those effects since their tendency is to interact and want to control things. This increases your chances of your juicy spells resolving later in the turn. The bottom line is the default rule should be to attack the Blue player(s) first and often until they’re out of the game, and then you can have an honest game of magic. Not a sermon, just a thought; you know where my bias lies. Many mono-Black decks will have a sub-theme that is directly dictated by the general. You have EDHREC and other resources to explore the decks in depth, but I wanted to give you some ideas here as you think about what I’ve shared over this series and incorporate into a mono-Black deck; the Commanders below are great examples. This is the standard mono-Black archetype and for good reason – it is the strongest. It comes in myriad flavors, so I warn you to keep it tight with the subflavor. The idea with MBC is to ramp, deploy threats, boardwipe to stabilize and gain card advantage, recur the creatures/threats of yours that died, and then win via the subflavor that is dictated by your general. The whole idea is to have a solid deck that is reinforced by your general, but not overly dependent upon it. I have identified sub-themes, but there are certainly more as MBC is a wide designation on a Black deck that seeks to control the board. Another popular strategy. This features efficient, recursive creatures-based threats and some lifegain to offset having insufficient blockers and the life you pay for spells in way one or another; Whip of Erebos is key in these decks I find as you are open to crack back attacks. You can go wide or go big – or ideally do both. Grave Titan and the Abhorrent Overlord are examples of the ‘both’ idea. Oftentimes, this is where black goodstuff decks fall. This is an archetype that is deceptively hard to do well. Zombies are a strong tribe, but because there are so many zombies you can’t just throw all the best zombies and some support tech in a deck and think it will run on all cylinders; YOU NEED TO HAVE A GAMEPLAN for the deck to work and be optimally fun. – Zombie Control: Balthor the Defiled. This is essentially a MBC deck that uses zombies as your lever to victory. You can board wipe with near impunity as your commander brings back your creatures. A mill strategy fills your graveyard for Balthor while also giving your activated abilities targets in other graveyard (i.e. Geth). You also lever black’s graveyard hate as a strength to minimize Balthor’s downside in that it is a universal reanimate for other player’s Red and Black creatures. Graveyard hate also handily robs other players of their graveyard shenanigans so is very good in the format in general. Going wide, death by repeated mill, and mass drain effects give you plenty of ways to win. Also, while Zombies are your main jam, you should have other good black creatures in the deck because Balthor brings back all Black creatures not just zombies. – Go-Wide Zombies: Ghoulcaller Gisa; Kalitas, Traitor of Ghet. With the many, many zombie lords and Coat of Arms effects, you have a plethora of ways to make a lowly group of 2/2’s into an Army of the Damned that is very scary. – Big Zombies: Korlash, Heir to Blackblade, Kalitas, Traitor of Ghet. Note that Kalitas can go both big and wide, which is very nice. Instead of going wide, you go big and use equipment like Strata Scythe, Nightmare Lash, and Lashwrithe to make choice zombies lethal. I feel like I’m leaving out an archetype or two, so if I am, let me know. I can expound more in the comment section. The bottom line is that Black is best when you are ramping, tutoring, and paying some life to draw cards that help execute the gameplan you want. If you squelch on any of these (and many new players do) the deck is not as strong as it could be. I contend that there is enough room for 1.5 to 2 themes in a mono-Black deck. That is purely my opinion but I find that you need to keep what you are doing tight. Tutors help you with a toolbox, but enough tutors themselves become a strategy, taking away card slots that actually ‘do’ something rather than just search for something, so be aware of that balance. With that, I think I will close out this article and this segment of the series. When I next come back, the plan is to do an article on unsung mono-black commanders; so I would love to get your input on what you want. Take it easy!